Sometimes people (especially my family) make really random choices. One of those choices was deciding to get a ferret. Sox.....It may have seemed like an odd decision, but I believe that Sox was the best investment we ever made. Having a ferret totally changes what you think is funny. This is a picture of him in his New Halloween Costume. 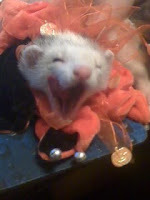 Yawning... ferrets are always yawning. They sleep at least 18 out of the 24 hours in a day. 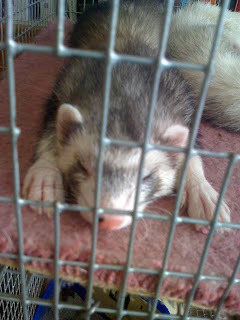 Because of out good friend Sox, we have "invested" in 4 more ferrets. Each one of them has his/her own personality. And each of them makes my heart glow with each new funny hour of the day when we play. Smallest to largest we have Moose, Patch, Sox, Charlie, and Doozer. Doozer and Charlie are the youngest, but they're the fattest!!!! If you go anywhere near the cage (you have to sneak up on them though, or they'll all come and look pathetic) Charlie is eating, Doozer is sleeping on the litter covered floor, Sox and Patch are huddled together on the carpeted floor and Moose is usually curled underneath one of those two. The ferrets play very well with the other pets, it's always interesting to see the maybe 4 inch tall Sox tackling the 3 foot Gabby. Very hardy creatures, but the dogs make sure to be as gentle as they possibly can, but I don't think I'd let then play without supervision. The ferrets are awesome with people. Our ferrets do not bite, they're absolute cuddle-bums. Sometimes they thow Hissy fits over a treat they shouldn't have (Chocolate, Licrorice) and make some pretty scary noises when we try to take them away. But they've never hurt anybody. Anyway, take care of your pets people, they're part of your family! And the wolf behowls the moon." Shhh. Don't tell anyone. But they are kind of cute!